The Hudspeth Cutoff is one of the many side trails we, at the California Trail Center, think you might be interested in as you study the history of the trail and its people. This track was used by many westward travelers during the California Gold Rush to save precious travel time. The previous route took travelers all the way to Fort Hall in Idaho. 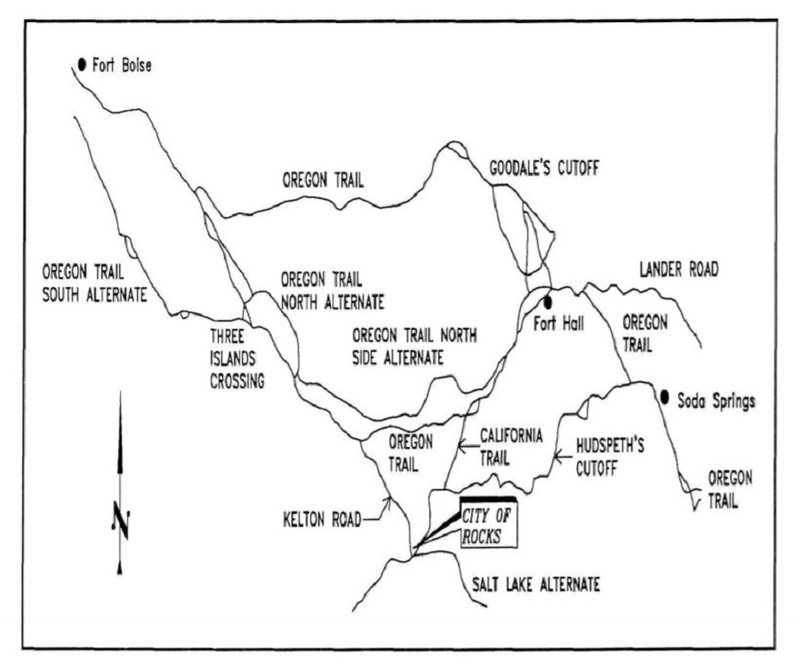 After this new route was trailblazed by Benoni M. Hudspeth, John J. Myers and a large group of pioneers in 1849, the Hudspeth Cutoff soon became a well-traveled part of the California Trail system. Pioneers in 1849, the 49’ers, hoped to start prospecting for gold as fast as possible. So, anything that got them closer to their goal faster than others was worth the risks. In this heat of the California Gold Rush, two experienced and talented mountain men, Hudspeth and Myers, created the Hudspeth cutoff to try and save valuable time. Benoni M Hudspeth had already traveled the original California Trail in 1843. Both men had traveled with John C Fremont to California in 1845, so they had experience with the area. On July 19, 1849, Benoni M. Hudspeth and John J. Myers lead a large party of 70 wagons from Missouri through a new, more direct route. This shortcut cut off the northernmost part of the California Trail to try and save time and get ahead in the race to the gold mines. It goes directly west to the California Trail northeast of the City of Rocks which is about 30 miles south of what is now Burley, ID. Hudspeth and Myers thought that the new cutoff would save significant time and lead them directly to the Humboldt River. Unfortunately, the pass only saved about 25 miles of travel distance and had several difficult stretches with four north-south ridges and limited water resources. Even so, this new route became the most commonly used route in the area over time. You can find a historical marker for the Hudspeth Cutoff in Fish Creek Summit, ID (close to Soda Springs, ID). The Hudspeth Cutoff fell into disuse after the Gold Rush ended. Now, very little of the modern highway follows the Hudspeth Cutoff. The present-day road that follows this historic route the closest is now named route 161 in Idaho and is about 125 miles long. The Hudspeth Cutoff is just one small part of this historic trail west. To learn more about the California Trail, plan a visit to the California Trail Interpretive Center in Elko, NV today. Here you can learn about the over 250,000 people who braved the elements and traveled on this difficult journey to California. Look at what pioneer wagons, handcarts, and tents were like in the 1840’s to 1860’s. We can’t wait to help you learn something new.